Owner: Molly Savard, et. al. History: Cherokee was originally designed and built for Herman "Swede" Whiton. Her first serious competition came at the 1930 British-American Team Race Challenge, steered by Cornelius Shields. She was joined on the team by US 44 Mars, US 36 Lucie (ex. Akaba) and US 52 Aphrodite. It was a clean sweep for the Americans. The next year Cherokee was chartered to the Cudahy family of Chicago and challenged for the Scandinavian Gold Cup in Norway, placing second to Norway's Magnus Konow in the Johan Anker design "Abu". After the regatta Cherokee came back to Long Island Sound where Whiton continued to tinker with her configuration, both the rig and hull, for the next few years. Cherokee went to Bermuda for the spring series held there in 1936. After these races, the trail gets a little cold for Cherokee. She certainly stayed part of the Long Island fleet and continued to sail until the outbreak of war, but eventually faded from the bright spotlights on the extended Seawanhaka scene. A 1957 Lloyds Register shows her in Port Washington, New York and she was later known as "Flying Home" while sailing out of the Shattemuc Yacht Club in Ossining, NY under G. Vernon Cowper. A cold molded "Cherokee" (Olin Stephens) was built in the 1960s for one of the original Cherokee owners. He cruised her South down the waterway and came back as far as Annapolis. I spoke with him about the boat in the 1970s and nearly purchased her. She stayed here and was purchased locally. At one point she was on the Magothy, owned by Tim Troy. She was hauled at Carbacks Marine on the Bodkin and was eventually destroyed in the mid-80's. The "Cherokee" built at IYRS in Newport is actually the 3rd iteration of 'Cherokee. Cherokee is listed among Olin Stephens' favorites in his book, "Lines - A Half Century of Yacht Designs by Sparkman & Stephens". 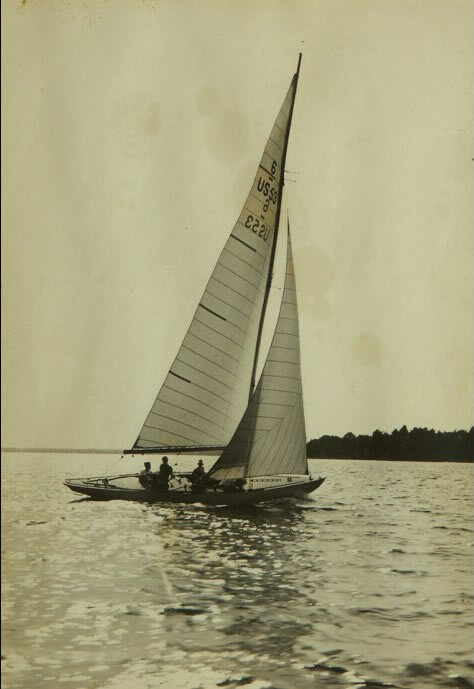 The image below shows Cherokee on Chesapeake Bay in the 1950's, where she sailed out of the Gibson Island Yacht Club and did battle with several other sixes that had migrated there, including US 66 Indian Scout. The new Cherokee was launched at Casey's Marina at IYRS on Saturday, May 30, 2009 at 1:00 PM.